I'm guest posting over at Cheeslave's blog today, on how GAPS can work in your family, encouraging you to give it a try if you think it's something your family could use. If you're coming from there, thanks for visiting! You can subscribe to Health, Home, and Happiness by Email for free (it's the whole post) or subscribe via RSS Feed. I'm also on Twitter and Facebook. What can you eat on GAPS? I've loved Tropical Traditions for their GAPS friendly food: Coconut oil, coconut cream concentrate, shredded coconut, and I'll have a review/giveaway of their coconut flour coming soon. If you place an order with them, we both get a bonus if you use my referral code: #5682145; you get a book on the awesome benefits of coconut and I get a jar of coconut oil, I really appreciate all my readers who use my code! 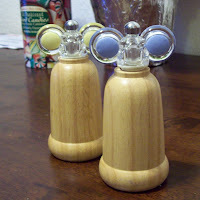 And for those of you who are not interested in GAPS, I present my new goofy looking salt and pepper grinders! 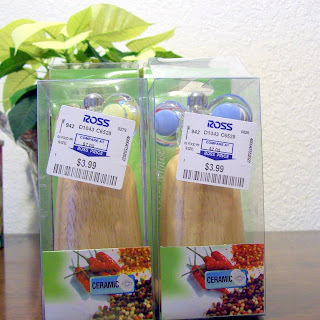 I've been looking for matching salt and pepper grinders at a reasonable price for at least 6 months. When searching for 'fancy' shoes for my little one, I ran through the housewares isle at Ross and found some. The grinder is even ceramic, which in my Real Salt post, was recommended in the comment section. So, they're a little silly looking... I'd seen nice looking ones in Bozeman when we were there, but they were over ten times as much. For $4 a piece, I can do silly for a while. They said they're 'mouse' grinders, I can see why :) And made in France, not China, which is always a plus. I'm not the only one who will compromise on looks in order to get affordable and functional, am I? 0 Response to "Guest Posting at Cheeseslave.com on GAPS"